“phenomenon of a sacred tree, particularly one associated with a sacred site, is well known in a variety of cultures. A distinguished tree, especially one of great antiquity, might be looked upon as the ‘tree of life’ or as being ‘cosmic,’ its stump symbolizing the ‘navel of the earth’ and its top representing heaven. In this sense, it is a bridge between the human and the divine spheres, and it becomes an arena of divine-human encounter, an ideal medium of oracles and revelation. Trees may have also symbolized the protection or fertility the worshiper hoped to receive from a deity. Fertility cults flourished in connection with such trees, and this form of paganism proved attractive to many Israelites” (Sarna, p.91). The Canaanite goddess Asherah is closely related to the sacred terebinth trees. Even etymologically the Hebrew words for “goddess” (elat), “terebinth tree” (ela or alla) and the two words for oak (elon and allon) are closely related (Ackerman, Asherah). It has been well known for some time that the Israelites embraced monotheism quite late in their history as evidenced by archaeological finds. Despite the fact that Israelites were forbidden to worship Asherah under the sacred Canaanite trees, “there are multiple indications in biblical tradition that many in ancient Israel did regard Asherah’s cult icon as an appropriate sacred symbol within the religion of YHWH,” (Ackerman, Asherah). It is against this backdrop that I read about Deborah who sat under a “luxuriant tree” called “the Palm of Deborah.” From this location Deborah summoned the general Barak to march against Sisera, the general of Israelite’s oppressors. Then she acted as military mastermind for the ensuing battle. Deborah’s tree was stationed between Bethal and Ramah, a location “significant in that it made her accessible to a majority of the tribes that she would muster for the war” (Gafney, p.33). In the time of the judges, the priesthood at Bethel was considered deeply corrupt therefore Deborah’s open-air court represented an alternative administrative and possibly cultic system. Traditionally the palm grew on the grave of Rebekah’s nurse Deborah who lived 600 years earlier, suggesting “Deborah the judge as nursemaid to a politically incapacitated Israel” (Fewell, Gender, p.123). Rasmussen notes that the word for “palm” in Hebrew is related to the iconography for the goddess Asherah (Rasmussen, p.90). Rasmussen postulates that there was an earlier story in which Deborah was the main warrior in the service of the goddess Asherah. A number of other scholars find connections with the account of Deborah with other goddesses such as Astarte and Anat. Deborah is further identified as eshet lappidot which is usually translated as “Lapidoth’s wife,” but could just as easily be translated as “fiery woman.” “The epithet would be highly appropriate. Deborah, enlightened judge, woman of action, inspired and inspiring poetess, well deserves such a denomination” (Bal, Murder, p.57). Frymer-Kensky (p.46) notes that “Lapidoth” is a strange sounding name for a man and she has determined that it is more likely that the word refers to Deborah’s impressive character rather than a husband. Aside from her name being an anagram of “she spoke” her name means “bee.” For a summary of the connection between Deborah with the matriarchal bee goddess of Cretan mythology, see Klein, especially note 3, p. 125. Judges 5 records a song attributed to Deborah. It is considered to be the oldest extant Hebrew literary composition dating to about 1125 BCE, near the time of the events it describes. “It was sung immediately after the victory was won. Such appears to have been a common practice in Israel during the period between the Exodus and David’s accession (ca. 1250-1000 B.C. )… These texts also indicate that women composed such songs, as has been the case elsewhere in the Middle East… As many scholars have pointed out, the last part of the poem has a distinctly feminine psychology” (Globe, p.495). If Deborah is the poet, then she was indeed a gifted woman, for Judges 5 is considered one of the greatest pieces of literature in the world. Along with Moses and Samuel, Deborah was one of the select few who were considered to be both a prophet and a judge. The two roles were integrated by these leaders because they heard the disputes of the people on God’s behalf. Then they inquired of Yahweh and delivered God’s answer to the inquirers. “The term judge is a poor one for us, because it makes moderns think of our bureaucratic court systems… Perhaps a better translation for the Hebrew term here would be ‘bringer of justice.’ Usually, these bringers of justice were military leaders who commanded the troops into battle. Once the threat to Israel was over, then the army disbanded and the bringer of justice went back to her or his other work” (Berquist, p.91). 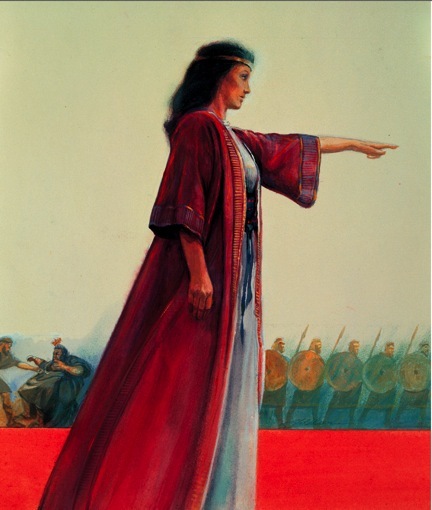 In the same way that the wise woman of Abel in 2 Samuel is depicted as a skilled counselor and head of a military faction, the equal of King David’s chief general, Joab, Deborah too emerges as a military commander (Ackerman, p.41). The prose and particularly the poetic account highlight her contribution to the war effort, her mustering of the troops and sending them into battle, her acclaim as the people’s deliver and the lead she takes in the postwar victory song. “Titles such as general, commander, war leader, and even warrior come readily to mind” (Ackerman, Warrior, p.32). But did Deborah actually go into battle? “It is, moreover, at least possible that the reference in Judg 5:7 to Deborah’s ‘arising’ to lead her people means to describe Deborah as actually rising up to lead Israel’s troops into military combat. To be sure, the poem makes no explicit mention of Deborah carrying weapons of war or fighting. But the poem also makes no explicit mention of Barak doing these things, although… modern commentators assume that he did… notice in verse 15 that the tribe of Issachar rushed forth at his heels–is immediately preceded by a description of how the chiefs of Issachar were ‘with’ Deborah. Should we not envision Issachar’s leaders as being ‘with’ Deborah on the battlefield in the same way that we see the tribe as a whole rushing to fight behind Barak” (Ackerman, Warrior, p.31-2). Gafney finds the text is quite clear that Deborah had a martial role in the conflict. “Deborah’s oracles indicate that she is both military strategist and warrior… Deborah suggests a flanking move, dividing the troops. Barak’s refusal to march without Deborah suggests that the initial plan was for Deborah to draw out Sisera without Barak while he occupied Mount Tabor. Barak’s need for Deborah’s presence may also indicate that he believes her presence would guarantee victory” (Gafney, p.91). In her military role she acted as God’s emissary, her very presence guaranteeing victory in the same manner that the presence of the Ark of the Covenant could guarantee victory in battle. There is no reason to think that biblical readers found anything strange about Deborah’s military role. Throughout Mesopotamian literature kings consulted female sages in times of war. “Most of the Assyrian prophets were women, and the reports from both the ancient and more recent Near East show a consistent pattern of the presence of women to inspire the troops and taunt the enemy” (Frymer-Kensky, p.46). In societies without a formal standing army, women often contributed to the defense effort (Meyers, p.174). Just for the record, I call your attention to Block’s article, “Why Deborah’s Different” for the case against Deborah’s military role. However, I do not find his arguments convincing. Whether or not Deborah participated on the battlefield, some feminist commentators (e.g. Fewell and Gunn) argue that she was trapped in a patriarchal system that condoned violence. When it comes to women and violence, I hold up the example of a woman being raped. If she uses violence to protect herself, is she a pawn of a male-dominant violent society? In my mind, she is doing everything she can to not be a victim. “Not all violence is immoral, nor is violence an appropriate activity only for men” (Bellis, p.117). Sometimes peace requires war though I think the bar for declaring war needs to be set at a very high moral level. Briefly I want to note that Deborah’s song mocks the Canaanite women imagining their warriors returning with their female captives. At the same time, mention is made of the Israelites taking captives (Judg. 5:12). Since the Israelite army destroyed Sisera’s entire army (Judg. 4:16) the captives would have to be the women and slaves of the baggage train (Bellis, p.118). For a lengthier analysis of this subject, look for my discussion of the ancient practice of capturing women in war. Deborah also gains the designation of “Mother in Israel.” Since she is not known for having children, what does the title mean? A Mother in Israel is “a woman to whose voice the entire nation pays heed as children listen to the instruction of their mother” (Goitein, p.12). It means that she liberates the oppressed, provides protection, gives counsel and inspiration and ensures the security of her people (Exum, Mother, p.85). “Extending such protection on occasion can involve the use of military force, and hence, ‘a mother in Israel’ must be willing to step forth as a commander who leads those under her protection in military encounters” (Ackerman, Warrior, p.42). In other words “Mother in Israel” is the title of Deborah’s political office. “The verb vatashar, literally ‘and she sang,’… refers to a female singer. Yet there are two syntactic subjects attached to this verb, Deborah and Barak…We might see in this peculiar grammar, which wreaks havoc on the principle of gender differentiation in Hebrew, another confirmation of Deborah’s method of defusing potentially incendiary situations. Although she alone produced the song, she lets Barak share in the credit so that the effect is one of unity and accord between the prophet and the solder, the spiritual leader and the man of action, female and male. This method is further exhibited in Deborah’s carefully structured verse: ‘Awake awake Deborah / awake awake utter a song: Arise Barak / and lead away your captive (5:12)” (Aschkenasy, Women, p.34). Deborah is the only judge who combines religious, military, judicial and literary leadership (in the form of inspirational singing and storytelling). The more I study the great women leaders of the Bible, the more I am convinced that there wasn’t a sharp distinction between victory singers, wise women and female prophets in ancient Israel. Thus if we study all the biblical women who fulfilled these various roles we may find that female religious functionaries were more prevalent than we thought at first glance. Block, Daniel I. – “Deborah Among the Judges: The Perspective of the Hebrew Historian” in Faith, Tradition, and History: Old Testament Historiography in its Near Eastern Context, Alan R. Millard, James K. Hoffmeier, and David W. Baker, eds. (Winona Lake, Ind. : Eisenbrauns, 1994) 229-53. Block, Daniel I. – “Why Deborah’s Different” Bible Review (Jun 2001), 34-40, 49-52. Craigie, Peter C. – “The Song of Deborah and the Epic of Tukulti-Ninurta” Journal of Biblical Literature 88 (1969) 253-65. Dempster, Stephen G. – “Mythology and History in the Song of Deborah” Westminster Theological Journal, 41 (1978) 33-53. Exum, J. Cheryl – “‘Mother in Israel’: A Familiar Figure Reconsidered” in Feminist Interpretation of the Bible, Letty M. Russell, ed. (Philadelphia: Westminster, 1985) 73-85. Fewell, Danna Nolan and David M. Gunn – “Controlling Perspectives: Women, Men, and the Authority of Violence in Judges 4 and 5” Journal of the American Academy of Religion 58 (1990) 389-411. Globe, Alexander – “Literary Structure and Unity of the Song of Deborah” Journal of Biblical Literature 93 (1974) 493-512. Goitein, S.D. – “Women as Creators of Biblical Genres.” Prooftexts 8 (1988) 1-33. Rasmussen, R.C. – “Deborah the Woman Warrior,” Anti-Covenant: Counter-reading Women’s Lives in the Hebrew Bible, M. Bal, ed. Journal for the Study of the Old TestamentSup 81. (Sheffield, Eng. : Almond, 1989) 79-93. Yee, Gale A. – “By the Hand of a Woman: The Metaphor of the Woman Warrior in Judith” Semeia 61 (1993) 99-132.